F.H. 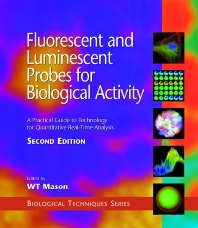 Kasten, Introduction to Fluorescent Probes: Properties, History, and Applications. R.P. Haugland and I.D. Johnson, Intracellular Ion Indicators. V.L. Singer and R.P. Haugland, Fluorescent Imaging of Nucleic Acids and Protein in Gels. D.N. Bowser, S.H. Cody, P.N. Dubbin, and D.A. Williams, Introducing and Calibrating Fluorescent Probes in Cells and Organelles. F. Bobanovic, Electroporation: A Method for Introduction of Non-permeable Molecular Probes. S.L. Shorte and S. Bolsover, Imaging Reality: Understanding Maps of Physiological Cell Signals Measured by Fluorescence Microscopy and Digital Imaging. J. Hoyland, Fluorescent Probes in Practice - Potential Artifacts. A.V. Zelenin, Acridine Orange as a Probe for Molecular and Cell Biology. J.W. Kok and D. Hoekstra, Fluorescent Lipid Analogues: Applications in Cell and Membrane Biology. S.R. Adams, B.J. Bacskai, S.S. Taylor and R.Y. Tsien, Optical Probes for Cyclic AMP. W.T. Mason, J. Dempster, J. Hoyland, T.J. McCann, B. Somasundaram and W. O'Brien, Quantitative Digital Imaging of Biological Activity in Living Cells with Ion-sensitive Fluorescent Probes. J. Dempster, Fast Photomeric Measurements of Cell Function. L.M. Loew, Potentiometric Membrane Dyes and Imaging Membrane Potential in Single Cells. J.-y. Wu, L.B. Cohen, and C.X. Falk, Fast Multisite Optical Measurement of Membrane Potential, with Two Examples. S. Antic and D. Zecevic, Imagine Membrane Potential Changes in Individual Neurons. G.B. Sala-Newby, J.M. Kendall, Helen E. Jones, Kathryn M. Taylor, Michael N. Badminton, David H. Llewellyn and A.K. Campbell, Bioluminescent and Chemiluminescent Indicators for Molecular Signaling and Function in Living Cells. G.A. Rutter, A.A. Culbert and J.M. Tavare, Luminescence Imaging of Gene Expression in Single Living Cells. S.R. Kain, Enhanced Variants of the Green Fluorescent Protein for Greater Sensitivity, Different Colors, and Detection of Apoptosis. R. Haggart, N. Bodsworth, and N. Foote, Rapid Detection of Microorganisms. C.J.R. Sheppard, Confocal Microscopy - Principles, Practice, and Options. K.-P. Yip and I. Kurtz, Dual-excitation Confocal Fluorescence Microscopy. Y.S. Prakash, M.S. Kannan, and G.C. Sieck, High-speed Confocal Imaging in Four Dimensions. G. Cox and C. Sheppard, Multiphoton Fluorescence Microscopy. P. Lipp and M.D. Bootman, High-resolution Confocal Imaging of Elementary Ca2+ Signals in Living Cells. A. Ichihara, T. Tanaami, H. Ishida, and M. Shimizu, Confocal Fluorescent Microscopy Using Nipkow Scanner. S.H. Cody and D.A. Williams, Optimizing Confical Microscopy for Thick Biological Specimens. B.R. Masters and B. Chance, Redox Confocal Imaging: Intrinsic Fluorescent Probes of Cellular Metabolism. G.J. Puppels, Confocal Raman Microspectroscopy. C. Rothmann, I. Bar-Am, Z. Dubinsky, S. Katz, and Z. Malik, Spectral Imaging of Autofluorescence Molecules and DNA Probes. B. Masters, P.T.C. So, and E. Gratton, Multiphoton Excitation Microscopy and Spectroscopy of Cells, Tissues, and Human Skin In Vivo. R. Wolthuis, T.C. Bakker Schut, P.J. Caspers, H.P.J. Buschman, T.J. R~mer, H.A. Bruining, and G.J. Puppels, Raman Spectroscopic Methods for In Vitro and In Vivo Tissue Characterization. G.J. Puppels, J.M.C.C. Coremans, and H.A. Bruining, In Vivo Semiquantitative NADH-fluorescence Imaging. T.W.J. Gadella Jr., Fluorescence Lifetime Imaging Microscopy (FLIM): Instrumentation and Applications. G. Skews and T. McCann, Detection of Fluorescently Labelled Proteins following Gel Electrophoresis: A Key Enabling Technology for Proteomics. P. Tomkins and A. Lyons, Properties of Low-light-level Intensified Cameras. R. Aikens, Properties of Low-light-level Slow-scan Detectors. C.D. Mackay, High-speed Digital CCD Cameras - Principles and Applications. E.R. Simons, Flow Cytometry: Use of Multiparameter Kinetics to Evaluate Several Activation Parameters Simultaneously in Individual Living Cells. A.M. Gurney, Photolabile Caged Compounds. K. Hahn, J. Kolega, J. Montibeller, R. DeBasio, P. Post, J. Myers and D.L. Taylor, Fluorescent Analogues: Optical Biosensors of the Chemical and Molecular Dynamics of Macromolecules in Living Cells. M. Fricker, C. Plieth, H. Knight, E. Blancaflor, M.R. Knight, N.S. White, S. Gilroy, Fluorescence and Luminescence Techniques to Probe Ion Activities in Living Plant Cells. G. Shamkar and M.A. Horton, Nuclear Calcium: Concepts and Controversies. A.W. de Feijter, J.E. Trosko, and M.H. Wade, Assessment of Gap Junctional Intercellular Communications in Living Cells Using Fluorescence Techniques. K.E. Sawin, J.A. Theriot and T.J. Mitchison, Photoactivation of Fluorescence as a Probe for Cytoskeletal Dynamics in Mitosis and Cell Motility. K. Florine-Casteel, J.L. Lemasters and B. Herman, Video Imaging of Lipid Order. Index. The use of fluorescent and luminescent probes to measure biological function has increased dramatically since publication of the First Edition due to their improved speed, safety, and power of analytical approach. This eagerly awaited Second Edition, also edited by Bill Mason, contains 19 new chapters and over two thirds new material, and is a must for all life scientists using optical probes. The contents include discussion of new optical methodologies for detection of proteins, DNA and other molecules, as well as probes for ions, receptors, cellular components, and gene expression. Emerging and advanced technologies for probe detection such as confocal laser scanning microscopy are also covered. This book will be essential for those embarking on work in the field or using new methods to enhance their research. Cell biologists, biochemists, molecular biologists, and physiologists; postgraduates and research workers in both academia and industry and clinical researchers. This book will be invaluable for those wishing to start using optical probes and also for researchers in the field who want to use the most up-to-date techniques. Dr. Bill Mason founded Life Science Resources in 1992 and until recently was Head of the Laboratory of Neural and Secretory Signalling at the Babraham Institute in Cambridge. He is recognised internationally as a leader in innovative R&D in real time, low light level imaging. Dr. Mason was awarded his PhD from the Physiological Laboratory in the University of Cambridge. He is also a Member of Trinity College, Cambridge. In addition to his academic and commercial interests, Dr. Mason acts as an expert scientific adviser for strategic and funding advisory bodies in the biomedical sciences including Medical Research Council (UK), NSF (USA), the Welcome Trust, the Nuffield Foundation and the Commission of European Communities. He has played a major role in UKÊscience and technology strategy as a Member of the Working Group on Higher Education and Highly Qualified Manpower for the Advisory Council on Science and Technology (ACOST) at the UK Cabinet Office in H.M. Government, where he co-authored consultative documents relating to government policy on education and training in science and technology.